A Successful Educational Fund raising event was held September 30, 2006 for Kaimi and for Kolam Foundation to support our journey to India. Thanks go out to all who attended and all who worked on this wonderful event. We have been asked to make it an annual event! 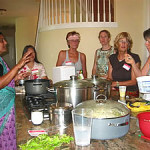 WAILUA, Kaua`i–Members of Ka `Imi Na`au`ao O Hawai`i Nei Institute are preparing to participate in a cultural exchange in Tamil Nadu, South India, in January 2007. 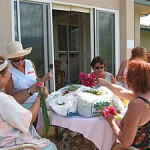 The Hawaiian culture educational group, under the direction of Kumu Hula Roselle Keli`ihonipua Bailey, will be coordinating the trip with Kaua`i representative Vi Ganesan of The Kolam Charitable Foundation, a foundation involved in working to benefit the needy and poor women, men and children in Tamil Nadu by helping them achieve economic independence. 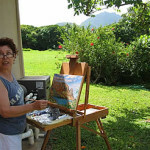 The group of about 20 Institute members of varied ages will come together from various branches of Ka `Imi, from Kaua`i as well as from O`ahu and Maui, California and Virginia, Samoa and Germany. Fundraising started some months ago. 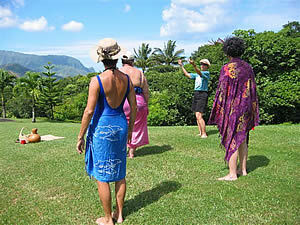 One of the key events toward this purpose on Kaua`i was a day sponsored by both organizations, “Kihapai Kou Mana” (“Tending Your Spiritual Essence”), held on Sept. 30, 2006, in Princeville. Participants came to feed mind, body and spirit in a beautiful setting for the cause. 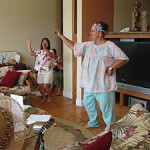 They partook of yoga, water exercise, hula movement, art classes, lei making, and various massage therapies provided by professionals. 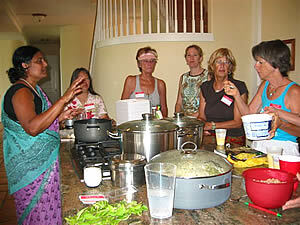 An Indian cooking demonstration and ongoing Indian luncheon prepared by Ms. Ganesan and her crew of volunteer helpers was served. Intricate needlework renderings of kolam symbolic designs on table napkins, place mats and runners hand embroidered by women of the cooperative were offered for sale, as well as beaded arts and jewelry made by a talented designer and member of Ka `Imi. Profits from these sales will be channeled into gifts to fund necessities for schools and colleges to be visited and funds for continuing work. 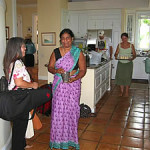 The two 501-3C non-profit groups are pooling resources to make the trip to India for the cultural exchange. During Thanksgiving weekend and early December special rehearsals for the touring program were held. 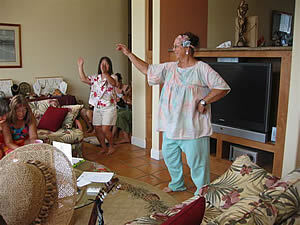 Musicians and dancers met on Kaua`i to practice under the guidance of Kumu Hula Bailey. 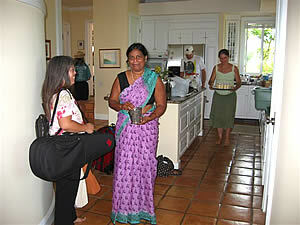 Ka `Imi members also visited Saiva Siddhanta Church and Himalayan Academy in Wailua Homesteads. They were escorted by Palanaiswami about the grounds. The visiting group, including Kumu Hula Bailey, walked the gardens to visit the ongoing project of the hand-carved Iraivan temple in process and met stone carvers from Bangalore, India, working on the traditional construction. They also learned the back stories of the lush plantings of many unusual tropical plants from Palanaiswami, who is directly involved with this botanical aspect of the temple grounds. He was also able to recount his experience of a group visit from leaders of the Kaua`i Aadheenam to Tamil Nadu and offer helpful information to the group now anticipating their own South India experience as the date for the travel to India approaches. 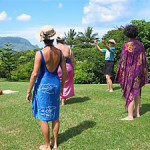 Members of Ka `Imi Na`au`ao o Hawai`i Nei Institute have participated in cultural exchanges in past years for the purpose of promoting Hawaiian culture and values embodied in hula, while at the same time experiencing and learning about the cultural ways and practices of other peoples. Among these have been exchanges with Maoris of Aoteroa (New Zealand); Native Americans of Nebraska, the Pacific Northwest and Canada; Pacific peoples meeting to share arts and culture at the Festival of the Pacific in Guam; and also people from Austria, Germany and Switzerland. 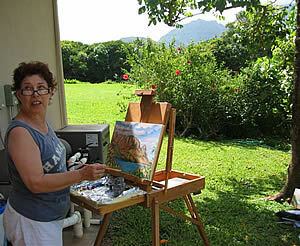 Tax deductible donations to help further the educational work of Ka `Imi may be made to: P. O. Box 1686, Kapa`a, HI 96746. 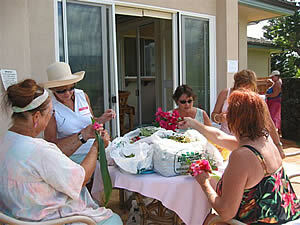 Further information may be obtained from the Institute’s web site, www.kaimi.org. Feed your mind, body and spirit in a beautiful environment for a noble cause! Saturday September 30, 2006 9:30 a.m.-4 p.m.
$100 donation includes all classes, Indian lunch, swimming, spa and ½ Hour Healing modality. Proceeds will be shared equally by our organizations and are tax deductible. *The Kolam Charitable Foundation, Inc.
A tax exempt foundation involved in doing charitable work to benefit the needy and poor women, men and children in Tamil Nadu, South India, by helping them achieve economic independence. 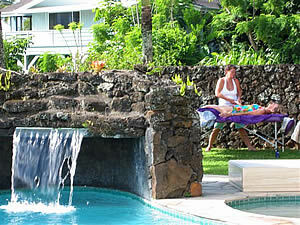 A tax-exempt educational organization dedicated to the preservation and promotion of the Hawaiian culture. Members of Ka`Imi will be visiting Tamil Nadu, South India in January 2007 for the purpose of cultural exchange and support for Kolam projects.